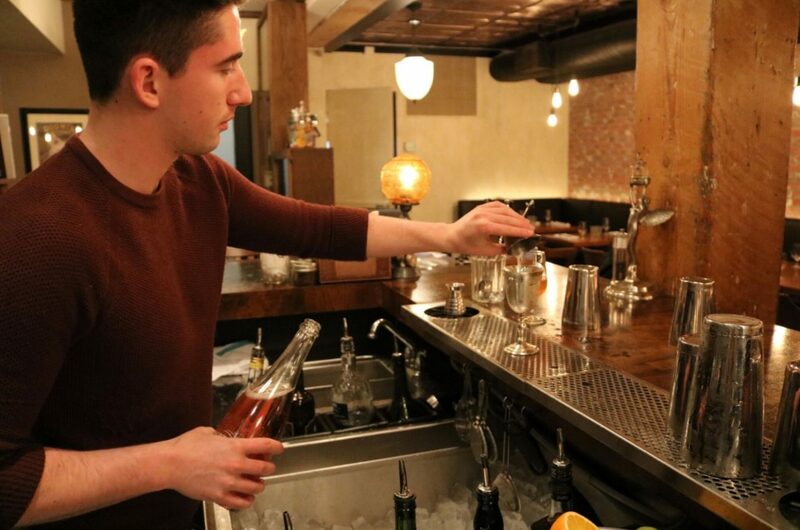 Whether you call them bar terms, bartender terminology or bartender lingo, it all equates to the same thing – the words you need to know to become a good bartender. Learning proper bar terms is not difficult – they’re aren’t that many and much is self-explanatory. Consider the list below to be a kind of bartending dictionary – a literal A – Z of bartender terms. Back – a ‘back’ is a small glass of something (like water or cola) which accompanies a drink. Bitters – a herbal alcoholic blend which is meant to be added to other cocktails to enhance flavour (e.g a Manhattan is rye, sweet vermouth and a couple dashes of bitters). Angostura Bitters is one of the most popular brands and was first invented by a German physician for stomach maladies in 1824. Blend – To mix up ingredients and ice in an electric blender. Depending on where you live, these could be called frozen drinks or blended drinks. Build – A bar term meaning to make a drink – starting with ice and then ‘building’ the drink by adding the other ingredients (i.e. alcohol, juice, garnish etc). Burnt – refers to martinis with Scotch. Some recipes call for 1:2 scotch to gin. While others are just a drop of a peaty single malt swirled around the glass and then dumped out. Then the gin is added. A burnt martini is technically not a martini as it doesn’t contain any vermouth. Call Drink – Refers to when the customer orders a drink by giving both the specific name of the liquor and the name of the mixer. E.g. Tanqueray Ten and Tonic, Bacardi and Coke. Chaser – In bar terms, anything that is consumed quickly after a shooter or straight (neat) shot of alcohol. Meant to ease the strength of the original shooter and / or to mask its taste. Chill – To chill a glass add ice and then water to any glass and let sit for a minute or two (while mixing the drink in a shaker). Pour out the contents of the glass and strain the drink into the chilled glass. This bar terminology is often used for martinis. 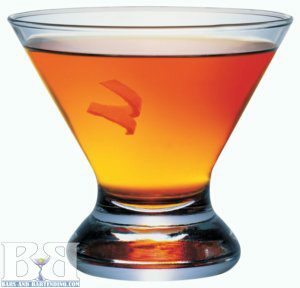 Cocktail – A mix of alcohol and / or liqueurs combined with a mixer (like soda or juice) and often shaken. Cooler – An alcoholic-based bottled beverage offered in a variety of different alcohols – vodka, rum, wine – which comes in a variety of flavours. (E.g. Smirnoff Ice, Wildberry cooler, Mike’s Hard Lemonade). Dash – A few drops or a very small amount of an ingredient. Dirty – Adding olive juice to a martini which makes it a Dirty Martini. The more olive juice, the dirtier the martini. Dry – Very little vermouth added to a martini. The more dry the customer wants their martini, the less vermouth added. Flame – Setting a drink on fire. Sambucca is often lit on fire to heat it up before putting the flame out and drinking it. Another common method is to use 151-proof rum which is very flammable. It’s not recommended to flame drinks unless you are VERY skilled. Bad things can happen! in a shooter glass. (E.g. a B-52 shooter contains Kahlua, Irish Cream and Grand Marnier. Kahlua is heavier than Irish Cream which is heavier than GM so each one floats on the other. This can be done by pouring very carefully down the side of the glass or pouring the floated alcohol over an inverted bar spoon, allowing the alcohol to trickle off the spoon in many directions). Frost – To frost a glass, dip it in water, let it drain and then put it in the freezer. This creates a layer of frost around the glass and works especially well for beer mugs. Garnish – A garnish is something added to a drink after the ingredients to enhance the presentation. Common garnishes are lemon slices or lime wedges, cherries, olives etc. Some garnishes are purely for looks and some are to add to the flavour of the drink. Highball – Any liquor mixed with soda, served in a tall glass (often called a highball). Jigger – A jigger is an hour-glass shaped steel measuring device – where one side measures 1 ounce (30ml) and the other measures 1½ ounces (45ml). However, jiggers come in many different sizes. Layer – Layering a shot or drink is done the same way as floating. The heavier alcohol goes on the bottom and the next, lighter alcohol gets floated on top using a careful pour down the side of the glass or a pour over an inverted spoon. Mixer – Mixers are the non-alcoholic ‘mixes’ that accompany alcohol in drinks. Mixers can be water, soda, juice, energy drinks etc (i.e. in the drink Rum & Coke, the mixer is Coke). Muddle – To crush up ingredients with a special tool called a muddler. This is done for drinks such as the Mojito – where the muddling process extracts essential oils and flavours (from the mint leaves in case of the Mojito). Neat – This ones important to know in bar terms. If someone asks for a whiskey neat, they are asking for a shot straight out of the bottle. Neat means no ice. Of course that shot must be in a whiskey glass. Whiskey drinkers are picky! Pony – A pony or pony shot is equal to 1 ounce. Rim – To rim a glass, first wet the rim with a lime, or the lime juice in a rimmer, then gently press the rim of the glass into a saucer of salt (for margaritas and Bloody Marys), celery salt (for Bloody Caesars) or sugar (for specialty coffees and cocktails). Be creative with your rim jobs – try to look for alternatives like crushed candy cane, flavoured salts or other more exotic spices that match well with your drink’s ingredients. Rocks (On the) – On the rocks simply refers to a drink with ice. Eg. Scotch on the rocks. Roll (aka Box) – Not heard all to often in bar terms. To roll or box a drink, first build the drink then pour it once into and out of a shaker tin. This gently mixes the drink. Sangria – A wine-based cocktail that contains wine, triple sec, orange juice and fruit. Many variations exist and some recipes may call for the addition of a different juice or may not contain triple sec but the basis of this drink is wine and juice. Shaker Tin – A shaker tin is usually metal while the mixing glass is made from, well, glass. Used to mix cocktails, first ice and ingredients are added to the shaker tin, then the mixing glass placed on top (creating a seal) and shaken. Shake – Fill a glass with ice, build the ingredients, then pour everything into a shaker tin and shake. Pour everything back into the original glass. Or, if you are an experienced bartender then you will be able to fill the shaker with ice and ingredients in perfect proportions. Shake and Strain – Put ice and ingredients into a shaker tin, shake and strain into a glass. Often used for shooters and martinis. Shooter – a shooter or shot is a 1-2 ounce serving of either straight liquor (like Tequila) or a mixture of alcohol (like a B-52 Shooter – Irish Cream, Kahlua and Grand Marnier) that is meant to be drank (or shot) in one gulp. Sour – the term ‘sour’ refers to the sourness of sour bar mix, bar lime mix, lime bar mix or margarita mix (all different names for what are essentially the same thing), which are used in many cocktails (such as a Margarita). If someone orders a Vodka Sour, they want vodka and bar lime mix. Speed Rail – This bar terminology typically means the long stainless steel shelf connected to the front of the sinks and ice well at bartender stations behind the bar. It holds the most commonly ordered liquor eg. rum, vodka, gin and whiskey, and possibly other popular liqueurs or mixes. Straight up – Refers to a drink, like a martini, which is shaken in a shaker and strained into a glass. In some areas, straight up is used interchangeably with ‘neat’. Strain – To drain the liquid out of a shaker tin. Toddy -A sweetened drink of liquor and hot water, often with spices and served in a tall glass. Twist – The rind of a lemon which is peeled using a special peeler called a zester or lemon zestor. The resulting lemon twist is thin and long. Virgin – refers to a non-alcoholic drink. Used to order common cocktails minus the alcohol. Eg. Virgin Bloody Mary, Virgin Pina Colada. Well Drink – Last but not least for bar terms, Unlike a Call Drink, a well drink is a drink where neither the brand of the liquor or brand of the mix is mentioned (E.g Gin & Tonic, Rum & Coke). That’s about all the bar terms you’ll need to know as a bartender. 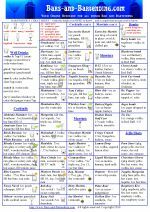 Get your FREE bartender cheat sheet hereClick here to get your hands on the #1 Free Bartender Cheat sheet on the Internet.